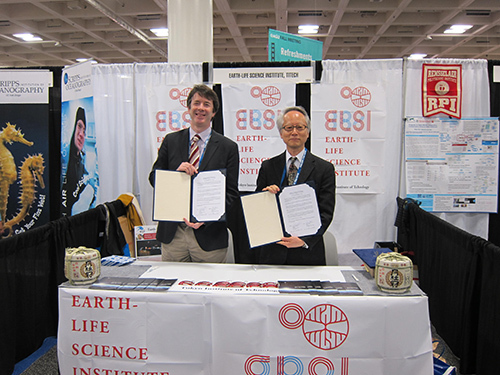 The Geochemical Society of Japan (GSJ) held a signing ceremony with the Geochemical Society (GS) and the European Association of Geochemistry (EAG) at the recent Fall AGU meeting in San Francisco, USA. The signed agreements intend to build collaborative activities between the three organizations in general and specifically with the V.M. Goldschmidt Conference. In attendance for the ceremony were President Naohiro Yoshida (GSJ), next President Hodaka Kawahata (GSJ), President Chris Ballentine (EAG), President Rick Carlson (GS), and Vice-President Barbara Sherwood Lollar (GS). Please see pdf file for details of MOU.